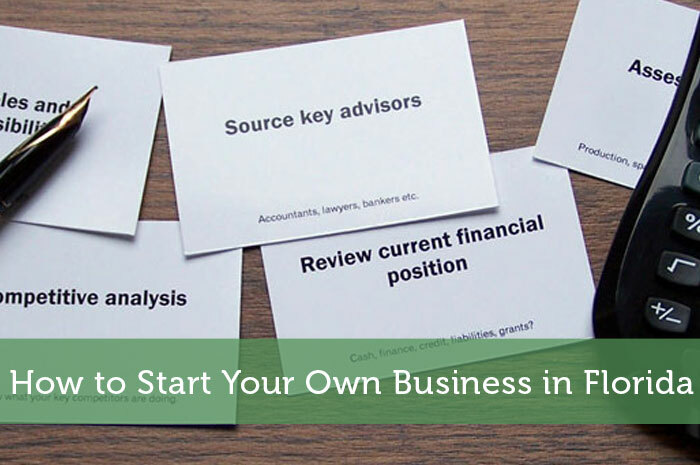 The following is a guest post about how to start your own business in Florida. If interested in submitting a guest post, please read my guest post policy and then contact me. Politicians would love for us to believe that the reason unemployment rates are finally beginning to fall is their brilliant policies. But the real reason is likely good old American ingenuity, not Washington lawmakers. Over the past decade, more than 10.7 million people have started their own businesses, and these entrepreneurs are competing with all sizes of corporations by offering quality goods and services at competitive prices. Are you ready to crank up your new Florida business venture? Here’s how. Your business plan doesn’t have to be set in stone from inception, but you do need to have three pieces of your business plan firmly in place. Many businesses start out without clear idea of exactly what the goals are. As you move through the remaining steps, revise your business plan according to what you discover. Some goals may be easier or harder than you initially expected, and the business plan should reflect this. Some businesses thrive anywhere, such as freelancing and consulting, but others need to be in populated areas to achieve success. For example, shipping charges for an online sales company may be higher in rural areas and more affordable in the metro areas. Retail stores and other businesses that depend on foot traffic also need higher concentrations of potential customers. For example, a big box store upselling Android tablets might decide to invest more in point of purchase displays based on the amount of foot traffic for their particular location. Research your industry to decide where the best place to set up shop actually is. The Small Business Administration (SBA) is a good resource for finding loans, as well as other information on starting a business. Certain industries, such as those producing green products and technologies, might also qualify for special government incentive programs. But don’t stop at the SBA. Research small business loans, and then refine your search for loans available to your particular industry. experience, and planning. Consider the job openings at FI to learn more about financing your own company. Florida is particularly welcoming to small business startups. Their low tax burden and lack of income tax opens the doors to businesses, and encourages consumers to let go of more of their income to buy products and services. Begin by researching state tax code at the Florida Department of Revenue website, and follow up by learning local tax code from your county, city, or a CPA with experience in small business tax matters. Florida has made huge strides in recent years toward simplifying the process for businesses to acquire necessary permits and licenses. Many duplicate processes were eliminated by merging departments. This also lowered the cost of business permits and licenses. Begin at the Department of Business and Professional Regulation, which handles all of the permits and licenses now. You can read about the entire process at www.myflorida.com, which also offers education and resources for small business owners. The number one reason new businesses fail is because the owners didn’t do their due diligence in researching the market or evaluating the negative aspects of the start-up. It’s tempting to get overly excited about starting your business and failing to recognize warning signs along the way. Is there actually a market for your products or services? Is the market already saturated? Is the product affordable? Furthermore, take a realistic look at what you’re able to do and what you’re willing to do towards the business. Starting a new business takes thousands of hours — and for most business owners this virtually erases any other plans for nights, weekends, and holidays for the first year or two, and perhaps longer. Can you afford the time and expense? Is your family willing to pick up the slack when you’re not available to help? You’ll only be happy and successful to the extent that you’re prepared for the road ahead. There are 23 million successful small businesses in the U.S.
Do these sound like failures to you? With the right planning and strategy, your Florida business can be a success story too. Interesting as I read this now – my friend has been really trying to get me to move to Florida and me and my boyfriend have really been considering it and opening up a business. Great information to have! And finally, praise the heavens above that you don’t live in California. Here you have to pay $800 a year to the state, regardless of if you earn a penny, plus taxes on any income, for the luxury of being registered as anything but a sole proprietor. Marketing, marketing, marketing! As you suggested, make sure you’ve thought through how you’re actually going to get people to give you their money.